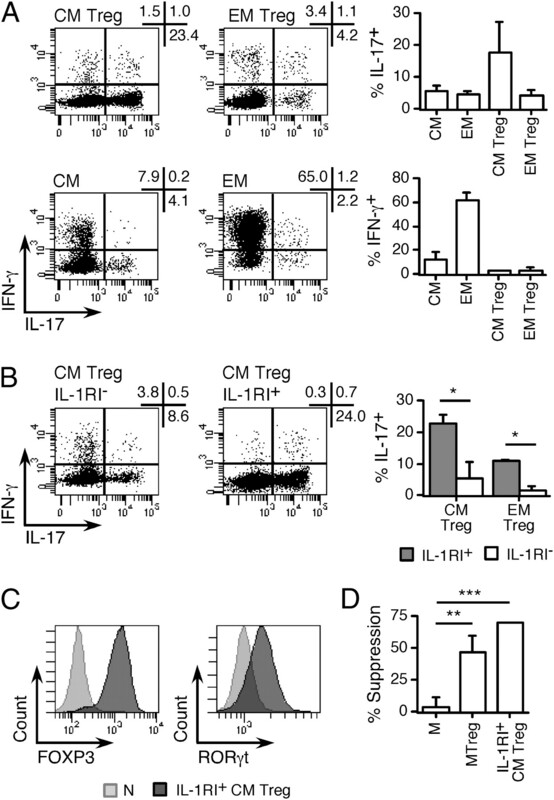 IL-17–producing CD4+ Th (Th17) cells are a unique subset of proinflammatory cells expressing the retinoic acid-related orphan receptor γt and associated with different forms of inflammatory autoimmune pathologies. The development of Th17 cells, mediated by TGF-β and IL-1, is closely related to that of FOXP3+ suppressor/regulatory T cells (Treg). In this study, we report that ex vivo expression of IL-1RI in human circulating CD4+ T cells identifies a subpopulation of FOXP3+ Treg that coexpress retinoic acid-related orphan receptor γt, secrete IL-17, and are highly enriched among CCR7+ central memory cells. Consistent with the concept that IL-1RI expression in Treg identifies a subpopulation at an early stage of differentiation, we show that, in Th17 populations differentiated in vitro from natural naive FOXP3+ Treg, IL-1RI+ IL-17–secreting cells are central memory cells, whereas IL-1RI− cells secreting IL-17 are effector memory cells. 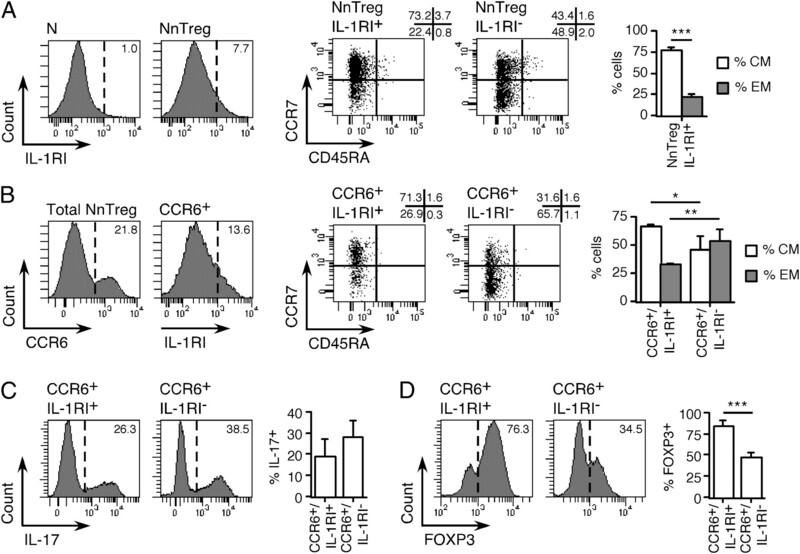 Together with the absence of detectable IL-1RI and IL-17 expression in resting naive CD4+ T cells, these data identify circulating CCR7+ Treg expressing IL-1RI ex vivo as early intermediates along an IL-1–controlled differentiation pathway leading from naive FOXP3+ Treg to Th17 effectors. We further show that, whereas IL-1RI+ central memory Treg respond to stimulation in the presence of IL-1 by generating IL-17–secreting effectors, a significant fraction of them maintain FOXP3 expression, consistent with an important role of this population in maintaining the Treg/Th17 memory pool in vivo. CD4+ Th cells secreting the proinflammatory cytokine IL-17 (Th17), associated with different forms of inflammatory autoimmune pathologies (1, 2) and characterized by the specific expression of the transcription factor retinoic acid-related orphan receptor γt (RORγt) (3, 4), have been defined as a separate subset, distinct from Th1 and Th2 with respect to both differentiation and function. The differentiation pathway of human Th17 cells has been hard to define, as stimulation of naive CD4+ T cell precursors in the presence of TGF-β and IL-6 efficiently generates murine but not human Th17 cells (5). The differentiation program of Th17 cells was initially reported as mutually exclusive with respect to that of regulatory/suppressive CD4+CD25+FOXP3+Treg, which exert opposite immune functions and differentiate in the presence of TGF-β alone (6). Recent data, however, have documented a close relationship between the two subsets. Namely, stimulation of memory regulatory T cells (MTreg) under inflammatory conditions converts them into Th17, IL-1 being the key molecule in promoting conversion (7, 8). In addition, MTreg contain a hybrid subpopulation of cells coexpressing FOXP3 and RORγt that exert suppressive functions but concomitantly secrete IL-17 ex vivo (9, 10). Finally, in the presence of IL-1, IL-2, TGF-β, and IL-23, human Th17 cells preferentially differentiate from natural naive regulatory T cells (NnTreg), a population of thymically derived human regulatory T cell (Treg) precursors (11), rather than from conventional CD4+CD25− naive T cells (12). Together, these data suggest that the differentiation pathway of Treg and Th17 cells is partially common. IL-1, the prototypic proinflammatory cytokine, exerts its effects through engagement of a receptor complex formed by IL-1RI and IL-1 receptor accessory protein, which is recruited to the complex after binding of IL-1 to IL-1RI (13). The essential role of IL-1RI in the differentiation of Th17 cells has been recently underlined by the inability of IL-1RI–deficient mice to generate Th17 responses, which makes them resistant to experimental autoimmune encephalomyelitis (14). Whereas the expression of IL-1RI in human CD4+ T cells has not been investigated until recently, a study from Lee et al. has documented selective expression of the receptor by a subpopulation of circulating CD4+ T cells enriched in IL-17–secreting cells (15). Two other studies, however, have reported selective expression of IL-1RI by Treg, both after culture and ex vivo (16, 17). To get insight into the role of IL-1RI in the differentiation of Th17 cells with respect to the existence of a partially common differentiation pathway with Treg, in this study we have assessed the expression of IL-1RI in human circulating conventional CD4+ T cells and Treg subsets ex vivo. 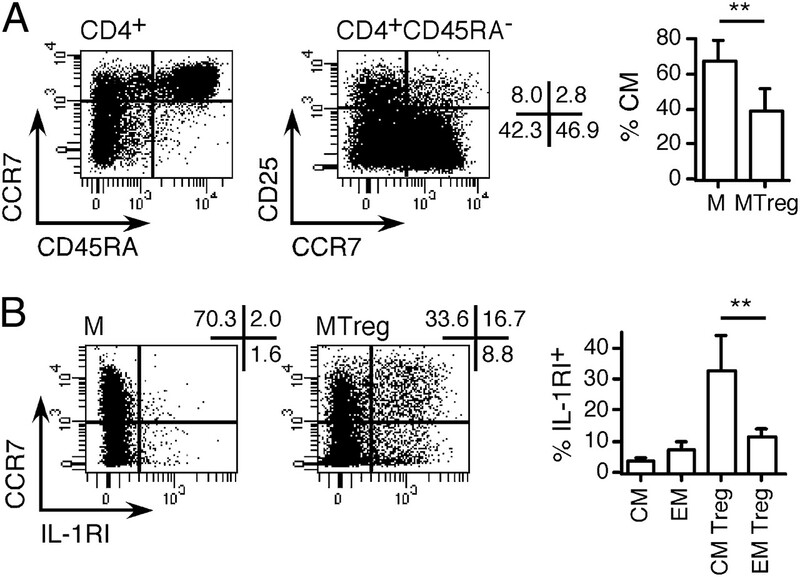 We report that IL-1RI expression in human CD4+ T cells is highly enriched in MTreg. IL-1RI+ Treg coexpress RORγt, secrete IL-17 ex vivo, and are highly enriched among CD45RA−CCR7+ central memory (CM) cells, a population at early stages of differentiation. We further show that in Th17 populations differentiated from ex vivo-isolated FOXP3+ NnTreg, IL-17–secreting cells expressing IL-1RI are CM cells, whereas IL-1RI− cells secreting IL-17 are effector memory (EM) cells. These findings identify circulating CM Treg expressing IL-1RI ex vivo as early intermediates along an IL-1–controlled differentiation pathway leading from NnTreg to Th17 effectors. IL-1RI+ CM Treg respond to stimulation in the presence of IL-1 by generating IL-17–secreting effectors while largely maintaining FOXP3 expression, consistent with an important role of this population in maintaining the Treg/Th17 memory pool in vivo. Peripheral blood samples were obtained from the Etablissement Français du Sang Pays de la Loire (Nantes, France) upon informed consent and approval by the Institutional Review Board. PBMCs were isolated by density gradient sedimentation using LSM 1077 lymphocyte separation medium (PAA Laboratories GmbH). CD4+ T cells were enriched by positive selection from PBMCs by magnetic cell sorting (Miltenyi Biotec). CD4+ T cells were assessed phenotypically by staining with fluorochrome-labeled mAb specific for CD45RA (BD Biosciences), CD25 (Beckman Coulter), and CD127 (eBioscience) together with mAb specific for FOXP3 (eBioscience), CCR7 (Miltenyi Biotec), and IL-1RI (R&D Systems), as indicated, and analysis by flow cytometry (FACSAria or LSR II; BD Biosciences). For ex vivo flow cytometry cell sorting, enriched CD4+ T cells were stained with fluorochrome-labeled mAb specific for CD8, CD4, CD45RA, CD25, CD127, CCR7, and IL-1RI. After gating on CD4+CD8− lymphocytes, cells were separated into the indicated populations to high purity (>97%) by flow cytometry cell sorting (FACSAria; BD Biosciences). RNA was prepared from the indicated ex vivo-sorted CD4+ T cell populations using RNeasy Mini Kit and RNase-Free DNase Set for on-column digestion of DNA (Qiagen). cDNA synthesis was performed using Promega Reverse Transcription System A3500 (Promega). Quantitative PCR was performed with a TaqMan assay on an ABI 7000 system (Applied Biosystems) using Assays-on-Demand Gene Expression probes for IL1R1 (Hs00168392_m1), IL1R2 (Hs01030384_m1), and TGFBR2 (Hs00947889_s1) (Applied Biosystems). For control of input RNA, we used TaqMan probe (FAM-5′-AAGGTGAAGGTCGGAGTCAACGGATTTG-3′-TAMRA) and primers (5′-CCACATCGCTCAGACACCAT-3′ and 5′-CCAGGCGCCCAATACG-3) for GAPDH. Relative mRNA expression was calculated as 2(Ct GAPDH − Ct test mRNA). Ex vivo-sorted conventional naive CD4+ T cells (N) and NnTreg (3 × 104/well in 96-well U-bottom plates) were stimulated with anti-CD2/CD3/CD28–coated microbeads according to the manufacturer’s instructions (Miltenyi Biotec) in the absence or presence of IL-1β (10 ng/ml; R&D Systems), IL-23 (100 ng/ml; R&D Systems), and TGF-β (10 ng/ml; PeproTech), as previously described (12). Ex vivo-sorted IL-1RI+ and IL-1RI− MTreg and CM Treg and EM Treg were stimulated in the absence or presence of IL-1β. Cells were maintained in culture in complete IMDM (Invitrogen) containing IL-2 (100 IU/ml; Chiron). In some experiments, cells were labeled with CFSE (Invitrogen) prior to stimulation. On days 6 to 12, aliquots of cultures were either assessed for cytokine production and transcription factors expression, as detailed later, or stained with IL-1RI–, CCR6-, CD45RA-, and CCR7-specific mAb, as indicated, and analyzed by flow cytometry. Day 12 N and NnTreg cultures were also stained with IL-1RI– and CCR6-specific mAb and sorted into CCR6+IL-1RI+ and CCR6+IL-1RI− populations by flow cytometry. Sorted populations were rested overnight prior to functional analysis. Cytokine production by sorted CD4+ T cell populations was assessed by intracellular staining after stimulation with PMA (100 ng/ml; Sigma Aldrich) and ionomycin (1 μg/ml; Sigma Aldrich) during 4 and 6 h for in vitro-stimulated cultures and ex vivo-sorted populations, respectively, as previously described (9, 12). Brefeldin A (10 μg/ml; Sigma Aldrich) was added 1 h after the beginning of the incubation. Cells were then fixed, permeabilized, and stained with Abs specific for FOXP3, RORγ/γt, IL-17 (eBioscience), and IFN-γ (BD Biosciences) and analyzed by flow cytometry. The ability of in vitro-differentiated or ex vivo-sorted CD4+ T cell populations to suppress the growth of responder CD4+CD25− T cells was assessed by coculture of CFSE-labeled responder conventional CD4+ T cells (3 × 104) with or without test populations (3 × 104), in 96-well U-bottom plates, in the presence of 3 × 104 irradiated monocytes, enriched by positive selection from PBMCs by magnetic cell sorting (Miltenyi Biotec), and PHA (HA16, 0.5 μg/ml; Oxoid), as previously described (11). Growth of responder cells was assessed by flow cytometry analysis of CFSE dilution in day 4 to 6 cultures. The growth (100 − percentage undivided cells) of the wells with suppressor cells (experimental group) was compared with that of the wells without suppressors (control). The percentage of suppression was determined as follows: 100 – [(growth of experimental group/growth of control) × 100]. We initially assessed IL-1RI expression in total circulating CD4+ T cells ex vivo using specific mAb. We detected significant surface expression of IL-1RI in a fraction of memory (CD45RA−) but not in naive (CD45RA+) cells (Fig. 1). To characterize further IL-1RI expression in the memory compartment, we stained CD4+ T cells with IL-1RI–specific mAb together with a combination of mAb against markers that distinguish conventional CD4+ T cells and Treg. Circulating MTreg are characterized by high ex vivo expression of CD25 and FOXP3 and low expression of CD127 (Fig. 2A). As illustrated in Fig. 2B, IL-1RI+ CD4+ T cells were highly enriched among MTreg compared with conventional memory CD4+ T cells. The mean fluorescence intensity of IL-1RI staining in IL-1RI+ MTreg was higher than that of conventional IL-1RI+ memory CD4+ T cells, suggesting a higher expression level. To confirm the differential IL-1RI expression in the defined populations, we isolated them by cell sorting and assessed IL-1RI expression by quantitative PCR. We found higher levels of IL-1RI mRNA in sorted total MTreg than in conventional memory CD4+ T cell populations (Fig. 2C). As expected, IL-1RI mRNA expression in MTreg was confined to the IL-1RI+ fraction, and only low levels of IL-1RI mRNA expression were detected in the IL-1RI+ fraction from conventional memory CD4+ T cells. Ex vivo expression of IL-1RI is detected in memory but not in naive human circulating CD4+ T cells. A, Enriched CD4+ T cells were stained with anti-CD45RA and anti–IL-1RI mAb, and IL-1RI expression was assessed in gated CD45RA+ and CD45RA− populations. B, Summary of the results (mean ± SD, n = 6). Statistical analyses were performed using two-tailed t test. **p < 0.01. Ex vivo expression of IL-1RI in human circulating CD4+ T cells is highly enriched in memory CD25+CD127lowFOXP3+ Treg. A, CD4+ T cells were stained with anti-CD45RA, anti-CD25, anti-CD127, and anti-FOXP3 mAb. FOXP3 expression is shown on gated CD45RA−CD25− conventional memory (M) and CD45RA− CD25+CD127low (MTreg) populations. B, CD4+ T cells were stained with anti-CD45RA, anti-CD25, anti-CD127, and anti–IL-1RI mAb. Numbers in the dot plot indicate the percentage of IL-1RI+ cells in the CD25+ and CD25− populations. Summary of the results for all donors (n = 6) is shown. MFI, mean fluorescence intensity. C, CD4+ T cells were sorted by flow cytometry into the indicated populations and assessed for IL-1RI mRNA (IL1R1) expression by quantitative PCR. *p < 0.05, **p < 0.01, ***p < 0.001. To assess the correlation between IL-1RI expression and ex vivo IL-17 secretion in conventional memory CD4+ T cells and MTreg, we isolated the corresponding IL-1RI+ and IL-1RI− populations by cell sorting, stimulated them with PMA/ionomycin, and assessed cytokine production by intracellular staining. We also assessed intranuclear expression of RORγt with respect to IL-17 secretion. Both among conventional memory CD4+ T cells and, to a higher extent, among MTreg, IL-1RI+ populations were enriched in IL-17–secreting cells (Fig. 3A, 3B). In all populations, IL-17–secreting cells were mostly RORγt+, but the proportion of RORγt-expressing cells and the expression levels were higher in MTreg than in conventional memory CD4+ T cells (Fig. 3C, 3D). All IL-1RI+ MTreg, irrespective of their ability to secrete IL-17 ex vivo, expressed high levels of RORγt. It is noteworthy that no significant IL-17 secretion was detected in isolated conventional naive CD4+ T cells or FOXP3+ NnTreg populations ex vivo (data not shown). Ex vivo expression of IL-1RI in Treg correlates with IL-17 secretion and expression of RORγt. CD4+ T cells were stained with anti-CD25, anti-CD45RA, anti-CD127, and anti–IL-1RI mAb and sorted into the indicated populations. Sorted populations were stimulated with PMA/ionomycin during 6 h, and IFN-γ and IL-17 production and RORγt expression were assessed by staining with specific mAb. A–D, IL-17 production is shown in relation to IFN-γ production (A, B) and to RORγt expression (C, D). *p < 0.05, **p < 0.01. To characterize further IL-1RI+ Treg, we assessed their differentiation stage. Memory CD4+ T cells have been distinguished into CM and EM populations based on the expression of the chemokine receptor CCR7 (18). We have previously shown that, similar to conventional memory CD4+ T cells, human MTreg can be distinguished into CM and EM populations, which are both anergic and suppressive ex vivo (19). MTreg contain lower proportions of CM cells as compared with conventional memory CD4+ T cells (Fig. 4A). Assessment of IL-1RI expression with respect to that of CCR7 in conventional and Treg populations, however, revealed that IL-1RI+ MTreg were enriched in CM cells (Fig. 4B). Assessment of isolated populations with respect to IL-17 secretion further showed that CM Treg were enriched in IL-17–secreting cells (Fig. 5A) and that, within CM Treg, IL-17–secreting cells were enriched in the IL-1RI+ fraction (Fig. 5B). 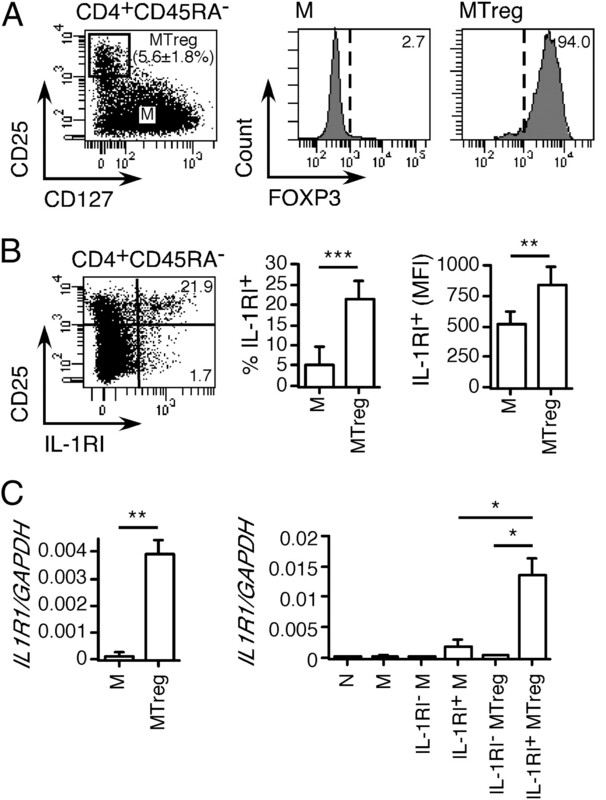 It is noteworthy that IL-1RI+ CM Treg were RORγt+ and FOXP3+ (Fig. 5C) and were highly suppressive ex vivo (Fig. 5D). CD4+ T cells expressing IL-1RI ex vivo are highly enriched among CM Treg. A, CD4+ T cells were stained with anti-CD25, anti-CD45RA, anti-CD127, and anti-CCR7 mAb. The percentage of CM cells among M and MTreg populations is shown. B, CD4+ T cells were stained with anti-CD25, anti-CD45RA, anti-CD127, anti-CCR7, and anti–IL-1RI mAb. The percentage of IL-1RI+ cells among CM and EM conventional and Treg populations is shown. **p < 0.01. IL-1RI+ IL-17–secreting cells are highly enriched among CM Treg. A, CD4+ T cells were stained with anti-CD25, anti-CD45RA, anti-CD127, and anti-CCR7 mAb and sorted into CM and EM conventional (CD45RA−CD25−, CCR7+ or CCR7−) and Treg (CD45RA−CD25+CD127low, CCR7+ or CCR7−) populations. B, CD4+ T cells were stained with anti-CD25, anti-CD45RA, anti-CD127, anti-CCR7, and anti–IL-1RI mAb and sorted into CM Treg and EM Treg IL-1RI+ and IL-1RI− populations. Sorted populations (A, B) were stimulated with PMA/ionomycin, and IFN-γ and IL-17 production was assessed by intracellular staining using specific mAb. C, A fraction of IL-1RI+ CM Treg and control naive (CD45RA+CCR7+CD25−) populations were stained with anti-FOXP3 or anti-RORγt mAb. D, The suppressive activity of sorted IL-1RI+ CM Treg and control M and MTreg populations was assessed as described (11, 12). *p < 0.05, **p < 0.01, ***p < 0.001. We have recently shown that, after stimulation in the presence of Th17-polarizing cytokines, human Th17 preferentially differentiate from NnTreg rather than from conventional naive CD4+ T cells (12). Priming of Th17 from NnTreg is accompanied by the induction of IL-1RI expression, consistent with the important role of IL-1 in the polarization. The finding that IL-1RI+ MTreg secreting IL-17 ex vivo are enriched in CM cells suggested that this population may represent an early intermediate in the differentiation pathway leading from NnTreg to Th17 cells. To obtain evidence in support of this hypothesis, we assessed the kinetics of IL-1RI expression induction after Th17 polarization of NnTreg. To this end, we labeled sorted NnTreg and conventional naive CD4+ T cells with CFSE, stimulated them in the presence of IL-2 alone or with Th17-polarizing cytokines, and, 6 d later, assessed IL-1RI expression in the corresponding cultures. As shown in Fig. 6, induction of IL-1RI expression was an early event of Th17 cell differentiation from NnTreg, as it was detected in a significant fraction of the cells early after stimulation, before cell division. This was true both in the absence and in the presence of Th17-polarizing factors but was significantly enhanced in the latter case. In addition, IL-1RI expression further increased after cell division, was sustained for several days, and slowly declined afterward. In contrast, no significant induction of IL-1RI expression was detected in conventional naive CD4+ T cells upon stimulation with IL-2 alone, and only low induction was detected in the presence of the polarizing factors. Early induction of IL-1RI expression in Th17-polarized NnTreg cultures. Ex vivo-sorted conventional naive CD4+ T cells (CD45RA+CCR7+CD25−) and NnTreg (CD45RA+CCR7+CD25+CD127low) were labeled with CFSE and stimulated with anti-CD2/CD3/CD28 microbeads in the presence of IL-2 alone or in combination with Th17-polarizing cytokines (TH17 PC: IL-1β, TGF-β, and IL-23). Cells were stained with mAb specific for IL-1RI 6 d after stimulation and analyzed by flow cytometry. A and B, Examples of dot plots for one donor (A) and a summary of data (B) corresponding to the percentage of IL-1RI+ cells in each division cycle, as determined by CFSE dilution, for all donors (n = 5) are shown. The chemokine receptor CCR6 has been described as a marker of Th17 effectors (20, 21). Accordingly, we have previously shown that in Th17 populations differentiated from NnTreg, IL-17–secreting cells are contained in the CCR6+ fraction (12). To address further the correlation between IL-1RI expression in the polarized NnTreg cultures and their differentiation stage, we assessed the expression of IL-1RI with respect to that of CD45RA, CCR7, and CCR6 as well as FOXP3 and IL-17. Consistent with the induction of IL-1RI expression early in the differentiation of Th17 from NnTreg, most IL-1RI+ cells in polarized NnTreg cultures were CM cells (Fig. 7A). In addition, within the CCR6+ fraction, expression of IL-1RI identified a population that was prevalently CCR7+ (Fig. 7B) and secreted IL-17 while maintaining FOXP3 expression (Fig. 7C, 7D), corresponding with the IL-1RI+ CM Treg population identified ex vivo. In contrast, CCR6+ IL-1RI− cells, which also secreted IL-17 but had mostly lost FOXP3 expression, were prevalently CCR7− cells, representing therefore a later differentiation stage of Th17. IL-1RI expression identifies CM FOXP3+ IL-17–secreting cells in Th17-polarized cultures from NnTreg. Ex vivo-sorted N and NnTreg populations were stimulated in vitro under Th17-polarizing conditions. A, Day 12 N and NnTreg cultures were costained with anti-CD45RA, anti-CCR7, and anti–IL-1RI mAb and analyzed by flow cytometry. Dot plots for one donor and data for all donors (n = 4) are shown. B, Day 12 NnTreg cultures were stained with anti-CD45RA, anti-CCR7, anti-CCR6, and anti–IL-1RI mAb and analyzed by flow cytometry. Histograms and dot plots for one donor and data for all donors (n = 4) are shown. C and D, Day 12 NnTreg cultures were stained with anti-CCR6 and anti–IL-1RI mAb and sorted into CCR6+IL-1RI+ and CCR6+IL-1RI− populations. Sorted populations were stimulated with PMA/ionomycin and stained with anti-FOXP3 and anti–IL-17 mAb. Histograms for one donor and data for all donors (n = 4) are shown. *p < 0.05, **p < 0.01, ***p < 0.001. Based on our conclusions that IL-1RI+ CM Treg are early intermediates in a differentiation pathway leading from Treg precursors to Th17 cells, it was of interest to address the responsiveness of this population to IL-1. To this end, we initially assessed the correlation between ex vivo expression of IL-1RI in Treg and their responsiveness to IL-1. We isolated IL-1RI+ and IL-1RI− MTreg populations by cell sorting, stimulated them in the presence of IL-2 alone or with IL-1β, and assessed the resulting cultures for IL-17 secretion. As expected, we observed significantly higher levels of IL-17–secreting cells in IL-1RI+ compared with those in IL-1RI− MTreg populations (Fig. 8A). Compared with stimulation with IL-2 alone, stimulation in the presence of IL-1β resulted in an increased proportion of IL-17–secreting cells in IL-1RI+ MTreg but also in IL-1RI− MTreg populations. Thus, responsiveness to IL-1β in MTreg was not restricted to the population expressing IL-1RI ex vivo. The responsiveness of IL-1RI− MTreg to IL-1 was explained by the fact that IL-1RI expression was rapidly induced in a large proportion of cells in this population after in vitro stimulation and persisted for several days (Fig. 8B). In contrast, it is noteworthy that, along with IL-1RI, IL-1RI+ Treg expressed increased levels of the decoy IL-1RII, which controls their responsiveness to IL-1 (Fig. 8C). Generation of IL-17–secreting cells by stimulation of IL-1RI+ MTreg in the presence of IL-1. CD4+ T cells were stained with anti-CD25, anti-CD45RA, anti-CD127, anti-CCR7, and anti–IL-1RI mAb, and MTreg (CD45RA−CD25+CD127low) were sorted into IL-1RI+ and IL-1RI− populations. A, Sorted populations were stimulated in vitro in the presence of IL-2 alone or with IL-1β, and IL-17 secretion was assessed in day 12 cultures in an intracellular cytokine staining assay after stimulation with PMA/ionomycin. Histograms for one donor and data for all donors (n = 8) are shown. B, Sorted populations were labeled with CFSE and stimulated with anti-CD2/CD3/CD28 microbeads in the presence of IL-2. Day 6 cultures were stained with anti–IL-1RI mAb and analyzed by flow cytometry. The percentage of IL-1RI+ cells in each division cycle, as determined by CFSE dilution, is shown. C, Expression of IL-1RII mRNA (IL1R2) in the sorted populations, as well as in conventional naive CD4+ T cells, was determined by quantitative PCR (n = 2). **p < 0.01, ***p < 0.001. To assess the impact of the differentiation stage on the generation of IL-17–secreting cells from Treg, we then isolated CM and EM Treg populations ex vivo and assessed them after in vitro stimulation in the absence or in the presence of IL-1. As shown in Fig. 9A, stimulation, particularly in the presence of IL-1, resulted in an increased proportion of IL-17–secreting cells in CM Treg and, to a lower extent, in EM Treg. In contrast, compared with EM Treg, FOXP3 expression was more sustained in CM Treg, both in the absence and in the presence of IL-1. Because FOXP3 expression is maintained by TGF-β (which is constitutively expressed in the latent form in Treg), we hypothesized that maintenance of FOXP3 in CM versus EM Treg may be due to a differential responsiveness to TGF-β. In support of this, we found that expression of TGF-βRII progressively decreased with Treg differentiation and was lower in MTreg compared with that in NnTreg but higher at the CM Treg stage than in EM Treg (Fig. 9B). Overall, these data indicate that, whereas IL-1RI+ CM Treg respond to IL-1 by generating IL-17–secreting effectors, a significant proportion of them maintain FOXP3 expression, consistent with an important role of this population in maintaining the Treg/Th17 memory pool. CM Treg stimulated in the presence of IL-1 generate IL-17–secreting effectors while maintaining a population of FOXP3+ cells. CD4+ T cells were stained with anti-CD25, anti-CD45RA, anti-CD127, and anti-CCR7 mAb, and MTreg (CD45RA−CD25+CD127low) were sorted into CM (CCR7+) and EM (CCR7−) populations. A, Sorted populations were stimulated in vitro in the presence of IL-2 alone or with IL-1β, and IL-17 secretion and FOXP3 expression were assessed in day 12 cultures by staining with specific mAb after stimulation with PMA/ionomycin. Dot plots for one donor and data for all donors (n = 7) are shown. B, Expression of TGF-βRII mRNA (TGFBR2) in the sorted populations, as well as in sorted NnTreg, was determined by quantitative PCR (n = 4). *p < 0.05, **p < 0.01, ***p < 0.001. In this study, we have assessed the ex vivo expression of IL-1RI in human circulating conventional CD4+ T cells. In contrast with a previous report by Lee et al. (15), we failed to detect significant ex vivo expression of IL-1RI (both at the protein and mRNA levels) in circulating naive CD4+ T cells, which do not contain significant proportions of IL-17–secreting cells (9, 20). In contrast, we detected ex vivo IL-1RI expression in a subset of circulating memory cells, enriched in IL-17–secreting cells. By assessing the differential expression of IL-1RI in memory conventional CD4+ T cells and MTreg ex vivo, we found highly enriched proportions of IL-1RI–expressing cells in MTreg, consistent with a recent report by Mercer et al. (17). We further showed that IL-1RI+ MTreg coexpress high levels of RORγt and FOXP3 and are enriched in IL-17–secreting cells, overlapping with an IL-17–producing FOXP3+ MTreg population that we and others have recently described (10, 12). Whereas this population simultaneously displays several functional features of both Th17 and Treg subsets, proinflammatory and suppressive, its origin and developmental relationship with Treg and Th17 effectors have remained undefined. Importantly, whereas initial studies in the mouse have reported TGF-β and IL-6 to be crucial for differentiation of Th17 (6, 22), with IL-1 only playing an enhancing role, the essential role of IL-1 signaling through IL-1RI for the early differentiation of Th17 has recently been demonstrated by the inability of IL-1RI–deficient mice to generate Th17 responses, which makes them resistant to experimental autoimmune encephalomyelitis (14). We have shown that IL-1 promotes conversion of human MTreg into Th17 (8) as well as, in association with other cytokines, differentiation of Th17 from NnTreg, which is concomitant with induction of IL-1RI expression in the cultures (12). The ex vivo identification of the IL-1RI+ MTreg population prompted us to hypothesize that this population could represent a common intermediate in a differentiation pathway leading to both Treg and Th17 effectors. By assessing IL-1RI+ MTreg with respect to their differentiation stage, we found that they are highly enriched among CCR7+ CM cells, a population at an early stage of differentiation. Although CM populations were initially considered nonpolarized, similar to naive T cells, subsequent studies have shown that they also contain pre-Th1 and pre-Th2 cells (23). Because circulating naive CD4+ T cells do not contain significant proportions of IL-17–secreting cells, we propose that, similar to the previously described pre-Th1 and pre-Th2 (23), IL-1RI+ CM Treg represent pre-Th17 cells (i.e., direct precursors of Th17 effectors). To corroborate our hypothesis, we characterized the differentiation stages of NnTreg stimulated under Th17-polarizing conditions in the presence of IL-1. We found that, in line with the concept that IL-1RI+ MTreg are at an early stage of differentiation, induction of IL-1RI expression in Th17-polarized NnTreg cultures was an early event. Accordingly, part of IL-1RI+ cells in the cultures were CM “bi-potential” Treg/Th17 populations that secreted IL-17 while maintaining FOXP3 expression. In contrast, IL-1RI− cells were mostly EM FOXP3− fully differentiated Th17 effectors. By assessing the responsiveness of MTreg sorted ex vivo to stimulation in the presence of IL-1, we further showed that, whereas IL-1RI+ CM Treg respond by generating IL-17–secreting effectors, a significant proportion of them maintain FOXP3 expression, consistent with an important role of the population in maintaining the Treg/Th17 memory pool. Together, the phenotypic and functional data obtained in this study support the concept that CD4+CCR7+IL-1RI+ MTreg/Th17 are early intermediates in a differentiation pathway that, starting prevalently from NnTreg precursors, is initially common to Treg and Th17, and then diverges to generate either Treg effectors under sustained immune suppressive conditions or Th17 effectors under inflammatory conditions, through IL-1/IL-1RI–mediated signals. Besides being a common differentiation intermediate of Treg and Th17 cells, the identified IL-1RI+ CM Treg population could also play an important role during immune responses in vivo. Notably indeed, a recent study by Kryczek et al. (24) has documented the presence of significant proportions of a population of FOXP3+ IL-17–producing cells in the colonic mucosa from individuals with ulcerative colitis and colitis-associated colon carcinoma. Although the precise stage of differentiation of the populations and expression of IL-1RI were not assessed in that study, these findings underline the physio-pathological relevance of Treg/Th17 “bi-potential” populations and warrant their further assessment. Our findings also have important implications with regard to the proposed use of NnTreg for immunotherapy of autoimmune diseases or after transplantation (25, 26). 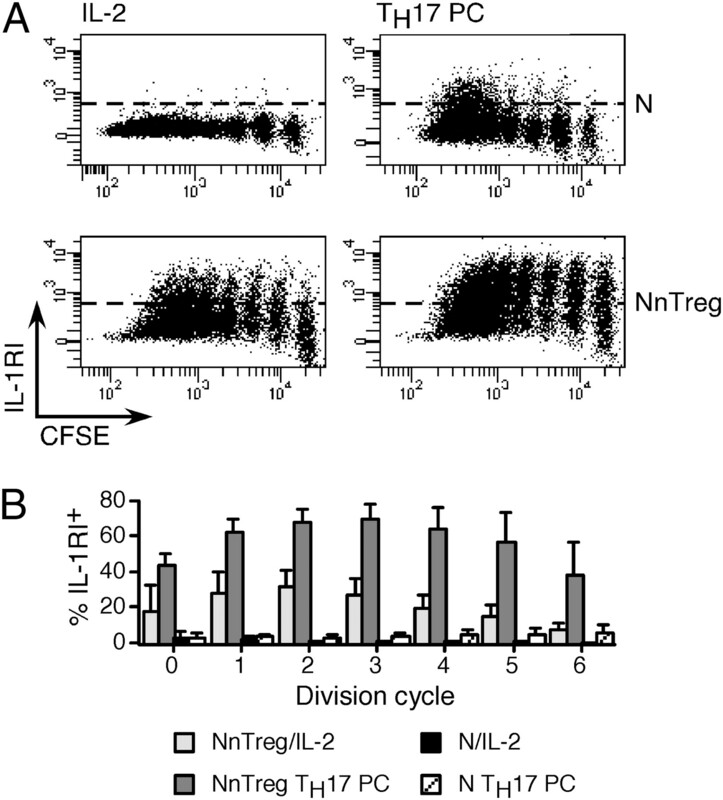 Indeed, although, as reported by us and others, in vitro-expanded NnTreg maintain high levels of FOXP3 expression and suppressive functions, stimulation of NnTreg in the presence of IL-2 alone or, to a higher extent, Th17 polarizing factors results in the rapid induction of high levels of IL-1RI expression and the generation of Treg/Th17 “bi-potential” effectors. Thus, the success of immunotherapy approaches based on the use of in vitro-expanded NnTreg will involve the need to control strictly the exquisite responsiveness of these populations to inflammatory stimuli in vivo. ↵1 D.V. and M.A. are senior coauthors. This work was supported by the Ludwig Institute for Cancer Research, the Cancer Research Institute, the Institut National du Cancer, and the Canceropôle Île-de-France. C.R. was supported through a fellowship from the Ligue Contre le Cancer.
. 2007. TH17 cells contribute to uveitis and scleritis and are expanded by IL-2 and inhibited by IL-27/STAT1. Nat. Med. 13: 711–718.
. 2008. Induction and effector functions of T(H)17 cells. Nature 453: 1051–1057.
. 2008. Human CD25highFoxp3pos regulatory T cells differentiate into IL-17-producing cells. Blood 112: 2340–2352.
. 2009. IL-1beta and IL-2 convert human Treg into T(H)17 cells. Clin. Immunol. 131: 298–307.
. 2009. Human memory FOXP3+ Tregs secrete IL-17 ex vivo and constitutively express the T(H)17 lineage-specific transcription factor RORgamma t. Proc. Natl. Acad. Sci. USA 106: 8635–8640.
. 2009. Identification of IL-17-producing FOXP3+ regulatory T cells in humans. Proc. Natl. Acad. Sci. USA 106: 4793–4798.
. 2005. A peripheral circulating compartment of natural naive CD4 Tregs. J. Clin. Invest. 115: 1953–1962.
. 2010. Human RORγt+ TH17 cells preferentially differentiate from naive FOXP3+Treg in the presence of lineage-specific polarizing factors. Proc. Natl. Acad. Sci. USA 107: 19402–19407.
. 2009. Selective expression of latency-associated peptide (LAP) and IL-1 receptor type I/II (CD121a/CD121b) on activated human FOXP3+ regulatory T cells allows for their purification from expansion cultures. Blood 113: 5125–5133.
. 2010. Expression and function of TNF and IL-1 receptors on human regulatory T cells. PLoS ONE 5: e8639.
. 2008. Differential expression of CCR7 defines two distinct subsets of human memory CD4+CD25+ Tregs. Clin. Immunol. 126: 291–302.
. 2007. Phenotypic and functional features of human Th17 cells. J. Exp. Med. 204: 1849–1861.
. 2004. Chemokine receptor expression identifies Pre-T helper (Th)1, Pre-Th2, and nonpolarized cells among human CD4+ central memory T cells. J. Exp. Med. 200: 725–735.
. 2011. IL-17+ regulatory T cells in the microenvironments of chronic inflammation and cancer. J. Immunol. 186: 4388–4395.
. 2010. Adoptive regulatory T cell therapy: challenges in clinical transplantation. Curr. Opin. Organ Transplant. 15: 427–434.